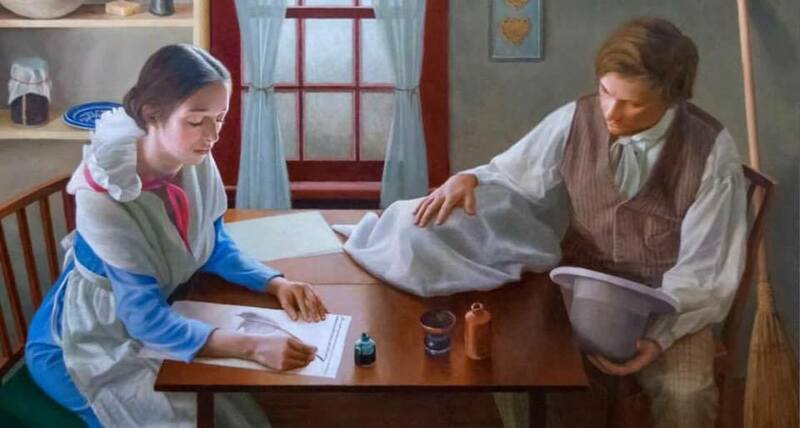 This update explores the complicated character of Emma Smith… she both supported and challenged her husband Joseph, and eventually helped found the Reorganized Church (RLDS). How can we appreciate her as her own person? As it is with Emma, so it is with all scripture… the complexity resists easy categorizations, but always invites appreciation. “Thou Art an Elect Lady”: This article gives context for the revelation now known as Doctrine and Covenants 25. Relief Society minutes for March 17, 1842: In these original minutes of the first Relief Society meeting, Joseph Smith explains that Emma’s calling to lead the Relief Society fulfilled the 1830 revelation to her and that “not she alone, but others, may attain to the same blessings” mentioned in the revelation. “Emma’s Susquehanna: Growing Up in the Isaac and Elizabeth Hale Home”: This article gives background information on Emma Smith’s early life. “Sally Phelps’s Hymnal”: This article discusses the 1835 hymnal that was compiled according to instructions in Doctrine and Covenants 25.